1 REMEMBER: The il form is the same for elle and on too! Time phrases normalement d’habitude de temps en temps l’année dernière il y a … ans le mois dernier la semaine dernière l’année prochaine à l’avenir Key Verbs & Tenses Who are we talking about? je – I il – he elle – she on – we nous – we ils – they (all male/mixed) elles – they (all female) ma mère – my Mum mon frère – my brother Remember if you are aiming for a C grade or above: *If you can use a variety of tenses, you stand a better chance of increasing your marks. *Add in the past (perfect and imperfect), present and the future to help you gain those marks. *If you’re feeling confident, you could add in the conditional. *You need to aim for accuracy: CHECK your tenses in your preparation time – DON’T take a random guess! The Present Tense – REGULAR VERBS This is used to talk about what you generally do or what you are doing right now. If you look up a verb in the dictionary, it ends in one of the following: -er, -ir or –re. This is known as the infinitive. To form the regular present tense, follow these rules: -er verbs ir verbs	-re verbs je chante je finis	je vends tu chantes tu finis	tu vends il/elle/on chante il/elle/on finit il/elle/on vend nous chantons nous finissons	nous vendons vous chantez vous finissez	vous vendez ils/elles chantent ils/elles finissent	ils/elles vendent When you look up the verb in the dictionary, e.g. choisir. Follow these instructions: Remove the ir from the end: chois Add the correct ending from above, depending on who you are talking about: je choisis EASY! 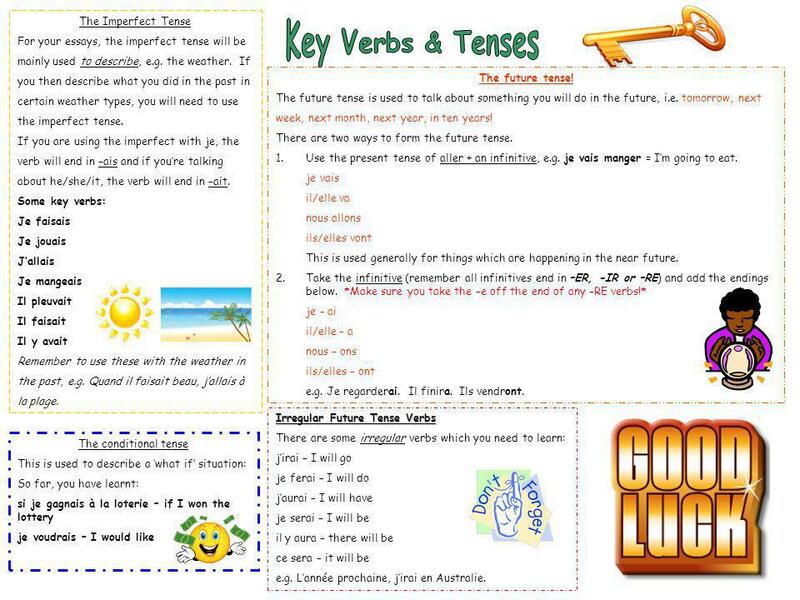 The Present Tense – IRREGULAR VERBS However, some verbs are irregular and need checking and learning. Here are some common ones: j’ai/il a/nous avons – I have/he has/we have je suis/il est/nous sommes – I am/he is/we are je vais/il va/nous allons – I go/he goes/we go je fais/il fait/nous faisons – I do/he does/we do je lis/il lit/nous lisons – I read/he reads/we read je peux/il peut/nous pouvons – I can/he can/we can je bois/il boit/nous buvons – I drink/he drinks/we drink je mange/il mange/nous mangeons – I eat/he eats/we eat j’achète/il achète/nous achetons – I buy/he buys/we buy je sors/il sort/nous sortons – I go out/he goes out/we go out REMEMBER: The il form is the same for elle and on too! There are two types of past tense in French: The perfect tense The imperfect tense The perfect tense is the one you need the most. It is used to describe something you did in the past, e.g. Hier j’ai regardé un film. The imperfect tense is used to describe something which happened regularly. It is also used to describe what something was like in the past, e.g. weather or feelings, e.g. Il faisait beau. Just a reminder of the most important people: je – I il – he elle – she nous – we ils/elles - they The perfect tense DR & MRS. VANDERTRAMP The following verbs are all formed with être. For this you need: je suis – tu es – il/elle est – nous sommes – vous êtes – ils/elles sont Devenir – to become (devenu) Revenir – to come back (revenu) Monter – to climb (monté) Rester – to stay (resté) Sortir – to go out (sorti) Venir – to come (venu) Aller – to go (allé) Naître – to be born (né) Descendre – to go down (descendu) Entrer – to enter (entré) Rentrer – to come back (rentré) Tomber – to fall (tombé) Retourner – to return (retourné) Arriver – to arrive (arrivé) Mourir – to die (mouru) Partir – to leave (parti) e.g. Je suis parti. Il est tombé. Je suis né. See the box next to this for more advice on how to form the perfect tense in French! 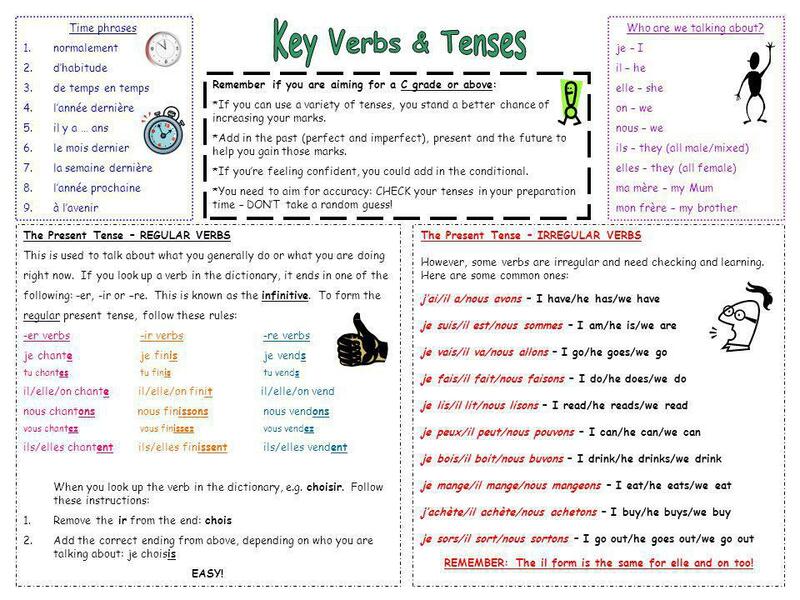 Key Verbs & Tenses The perfect tense – how to form it: The perfect tense has three parts: The person you are writing about, e.g. je The auxiliary verb, either avoir or être The past participle, e.g. fait Most verbs are made up with avoir. For this you need: j’ai – tu as – il a – nous avons – vous avez – ils ont This is how to form REGULAR past participles: acheter – achet – acheté finir – fin – fini vendre – vend – vendu Here are some examples: J’ai acheté un stylo. Il a fini ses devoirs. Ils ont vendu des glaces. 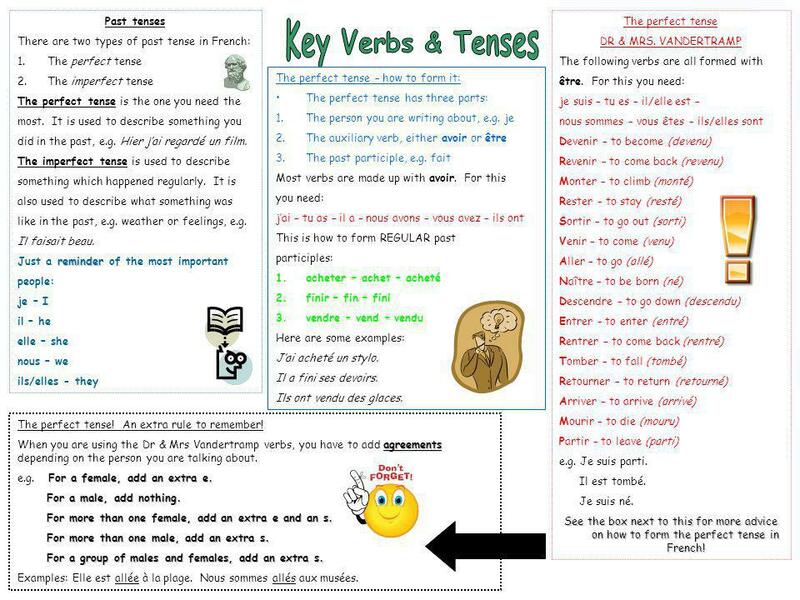 The perfect tense! An extra rule to remember! When you are using the Dr & Mrs Vandertramp verbs, you have to add agreements depending on the person you are talking about. e.g. For a female, add an extra e. For a male, add nothing. For more than one female, add an extra e and an s. For more than one male, add an extra s. For a group of males and females, add an extra s. Examples: Elle est allée à la plage. Nous sommes allés aux musées. 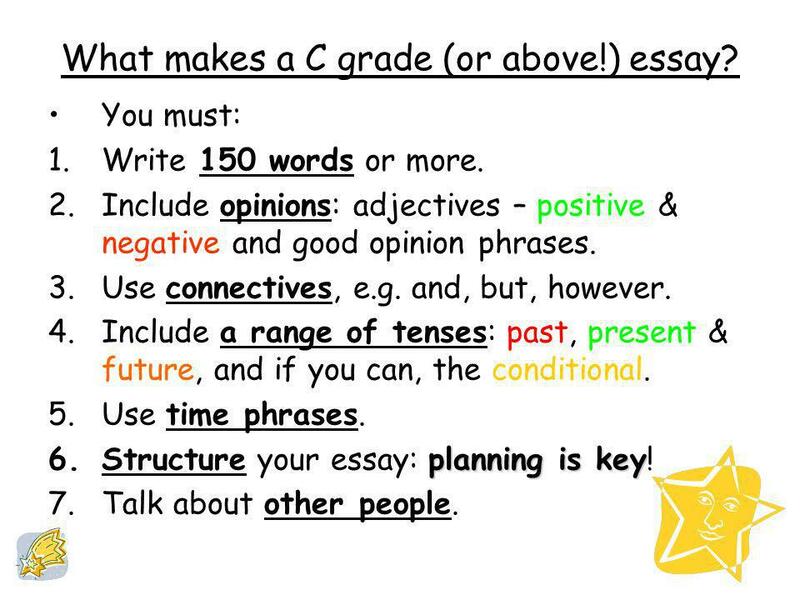 4 What makes a C grade (or above!) essay? You must: Write 150 words or more. Include opinions: adjectives – positive & negative and good opinion phrases. Use connectives, e.g. and, but, however. Include a range of tenses: past, present & future, and if you can, the conditional. Use time phrases. Structure your essay: planning is key! Talk about other people. Download ppt "REMEMBER: The il form is the same for elle and on too!" - Er verbs Regular – er verbs in the Present, Past, Future and Present Conditional Tenses. © Mark E. Damon - All Rights Reserved Round 1Round 2 Final Jeopardy Monique. Unité 1 au jour le jour. FRENCH CLUB TODAY ! Eiffel tower: tower. Limparfait Français II H – Unité Préliminaire A Structures. All about the imperfect tense and how to form it.